Sunrise is a special time of day. The magical golden light only lasts a short while, but the glow casts a warmth on the morning despite the coldest of temperatures. 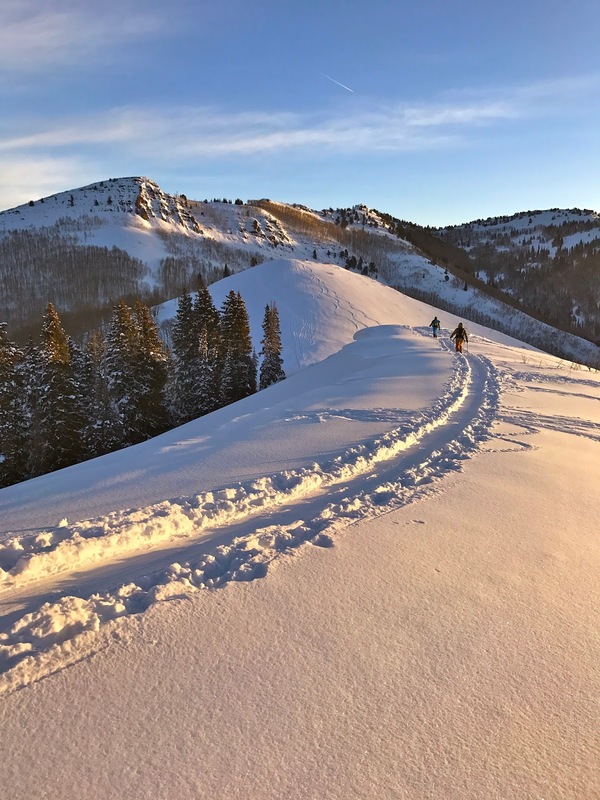 This particular morning touring with my friends, Loren Griswold and Alex LeBlanc, was one of the coldest mornings of winter. 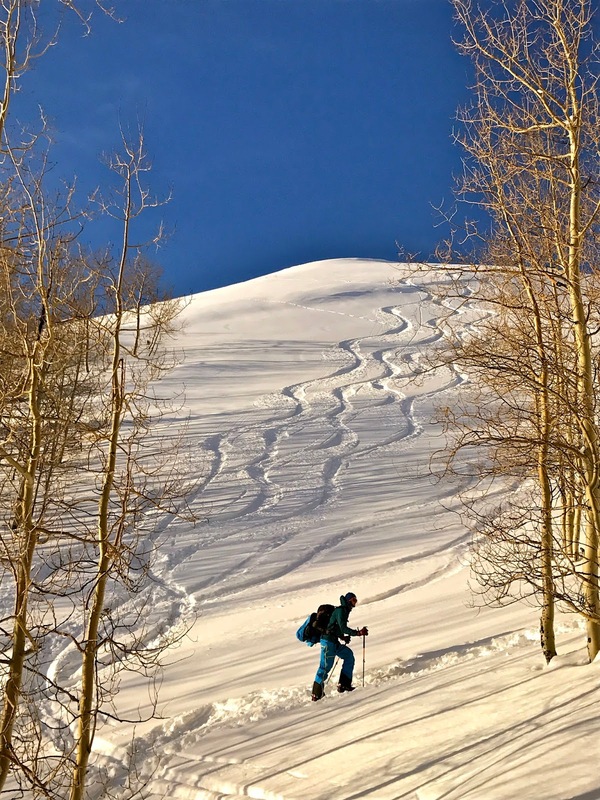 Having started our day in the dark, the bitter cold bite as I changed from my street clothes to my ski gear penetrated straight to my bones. When we shoved off on the tour the blood started pumping and finally began to warm the bones to heal the bite of the cold. An hour later we were crested the ridge and the sun began to emerge over the distant peaks. ^The sunrise had cast that magic light on our travel, and I had to stop and snap this picture of Alex and Loren making their way across the ridge. My fingers damn near froze in the short moment as I tried to snap this one off, but once back into the gloves and moving across the ridge I warmed right back up. 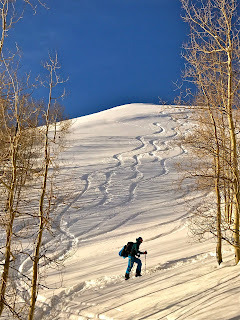 ^…beautifully lit powder turns. Loren got some deep action in this photo. Not as deep as my mind set was, but pretty deep none-the-less. These sunrises with my friends always gets me so nostalgic, reflective, and grateful. I get as gitty as a school girl, and each turn makes me giggle. ^Loren made his way back up for another lap in this picture above after the glory of our first turns of the day elevated our spirits beyond the surrounding peaks. The sunrise was like that maraschino cherry on the top of a tasty brandy old fashioned. Seemed to me that the beautiful sunrise was like the drink special of our day. Like the universe giving us a deal with a "sunrise special". ^As the morning progressed it continued to deliver. 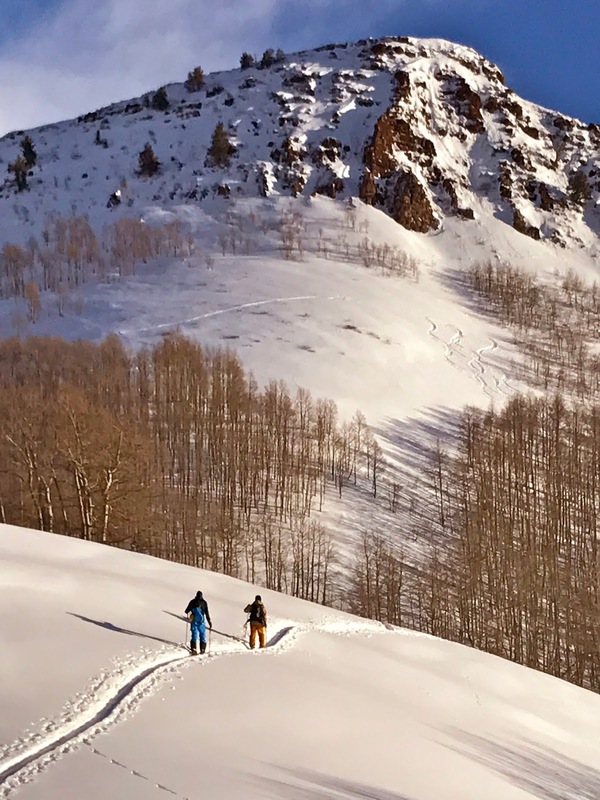 Loren and Alex traverse across the sun kissed slope in the picture above towards our next morning meadow skipper. 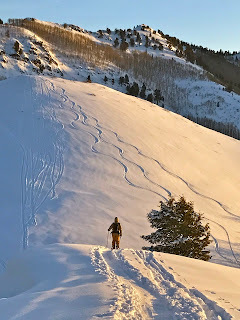 We put together a nice little circuit of these smaller low angle slopes on a "considerable" rated avalanche morning in the higher elevation larger slopes. 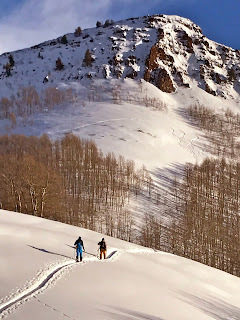 ^On a day when the avalanche dragons were active up high, I had absolutely no problem relegating to meadow skipping in the low land aspen groves of Big Cottonwood Canyon. Alex and Loren ascended into the magic forest amidst magic light. Meanwhile, I snapped away at them like the paparazzi and giggled to myself from across the ridge. ^When the mountains rewarded our touring with amazing powder turns like the one Alex is making in this picture above how could we be anything but grateful for every last bit of it. As I stated at one point in our morning, "How can you have a bad day when it starts like this?!"